Grilled Chicken Salad | Let's Eat! 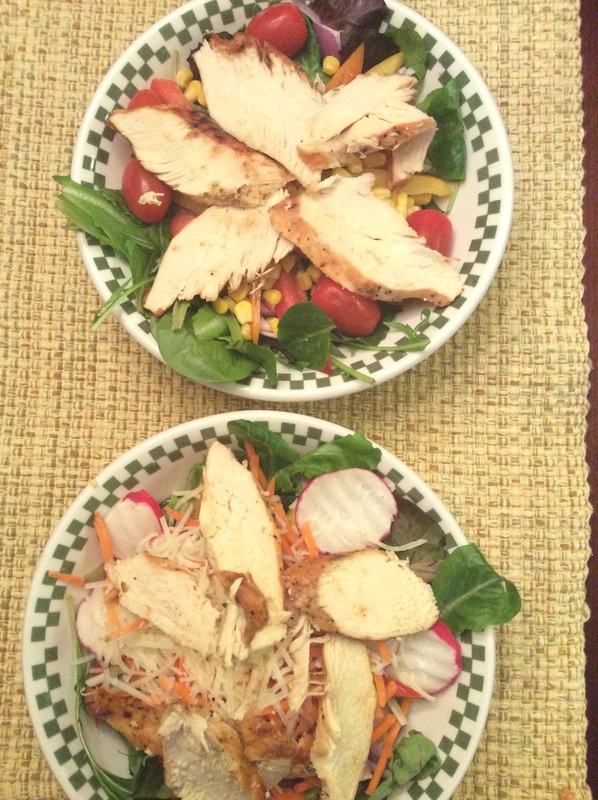 I know this may be crazy, but I realized when I was cooking dinner tonight that my wife and I eat grilled chicken salad more than any other meal. I also realized that it’s never the same way twice and I like it a lot! I like mine my way, she likes hers her way. No salad is ever exactly the same as another, which makes it a different meal every time you eat it! It’s not really cooking but it’s worth writing about! Whatever you like on it! I like mine with Caesar dressing and sometimes Balsamic, my wife loves Ranch. I like mine with radish, pepper, carrots and Parmesan cheese, my wife like tomatoes, purple onions and red, yellow and green peppers and corn. That’s the beauty of the salad! Here is how ours turned out!! Have fun! This entry was posted in Recipes and tagged Chicken salad, Grilled chicken salad, Salad. Bookmark the permalink.